It's never the wrong time to give your business a little makeover in the tech department. It's too easy to be concerned with dolling up the consumer-facing departments and let your back of the house operations grow old and dusty. By streamlining the inventory ordering process, BlueCart allows chefs, restaurant managers, and operations managers to spend more face time with customers and clients. One of the biggest precautions anyone in the procurement space has towards tech integration is implementation time. To be fair, it is a daunting task to remodel the way you do things. But if my elementary school report cards taught me anything, ignoring the problem won't fix anything. BluCart's platform has been built with the user in mind, and simplicity is very important. In fact, you can master the platform in about 4 minutes with this quick overview video. 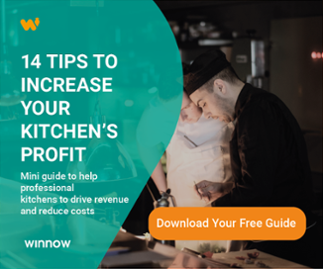 Through a restaurant industry survey conducted by BlueCart (of approximately 13,000 users), it was discovered that the average chef or manager spent an hour and 41 minutes on ordering every week. On BlueCart, that number turns into 43 minutes. Through the seamless implementations users have experienced a tremendous increase in productivity and efficiency. The restaurant and hospitality industry's procurement department is largely run by paper, pencil, email, and voicemails. By eliminating that ancient chain of operation, users realize a larger bottom line and enhanced buyer-vendor relationships. Optimizing your online ordering creates more value where there was previously very little. You can check out the full Restaurant Savings Guide here. Keeping tabs on your inventory is paramount when you're ordering from several vendors. When you are sending out orders in every direction, a robust system to manage your par and on-hand levels will do wonders for your day-to-day operations. According to Internet Retailer, Within the next 3 years 48% of B2B customers will place 50% or more of their orders online. This means restaurant owners and finance managers will see a heavy shift in favor of online ordering platforms. With a projected increase in online inventory management, restaurants and hotels should take advantage of early adoption and start implementing the tech tools they’ll need to scale with the demand of the market. In other words, the market is growing, and it's taking its suppliers with it. To answer the call for growth, 67% of suppliers are planning to switch to mobile devices to manage inventory. Tech doesn't just stop at convenience. A study conducted by the New England Journal of Medicine reports that having a solid inventory management software in place can reduce errors by 41.4%. Ordering platforms like BlueCart (who is launching inventory management later in October) exist to serve the needs of the supplier. In a few clicks, any user can set par levels and receive exactly how much inventory they need to order to stay at their desired level. In fact, you can take it one step further and receive detailed graphs that highlight trends over time, allowing you to optimize your future inventory levels and lower food waste. Modifying your operations to implement an inventory management platform will increase your bottom line, reduce stress, and get you home on time. Neglecting to infuse your business with the upgrades can only lead to headaches in the long run. Shying away from addressing inefficiencies is the best way to fall behind, and with the kind of tools at your disposal these days, there really is no excuse for sticking to the old way of doing things. But where there are missing pieces, there is opportunity. Give your business the juice it needs to cross the finish line. Tech isn’t going anywhere, and if you embrace it now, neither will your business.